Does anyone know if there are maps of the area that would show the locations of the camp sites? I've been searching online but there is very little information. The official web site says there is a map at the entrance, but I'd like to do a little homework before rolling up at the gate! Excellent information for the NP. Thank you. Specifically I'm seeking info regarding the BGWMA - there seems to be very little published info but from what I've heard it is some very beautiful and very remote territory. Here is another one for trails, backcountry roads, and paved roads. Just click on the track and it will show the name. While those are great maps for the National Park, they seem to be a bit empty for the Black Gap Wildlife Management Area. Sorry Dillomaster, unless ShaneA stops by with some relevant and useful info, you may be out of luck. Ooops, didn't see it was for BGWMA.. I did come across this map, which shows a few landmarks at least. Nothing official or knowledgeable here, just my GE armchair explorations. to the ground, judging by their shadows, to be camping shade shelters. You'd think we could find something official online with more details. The search continues. 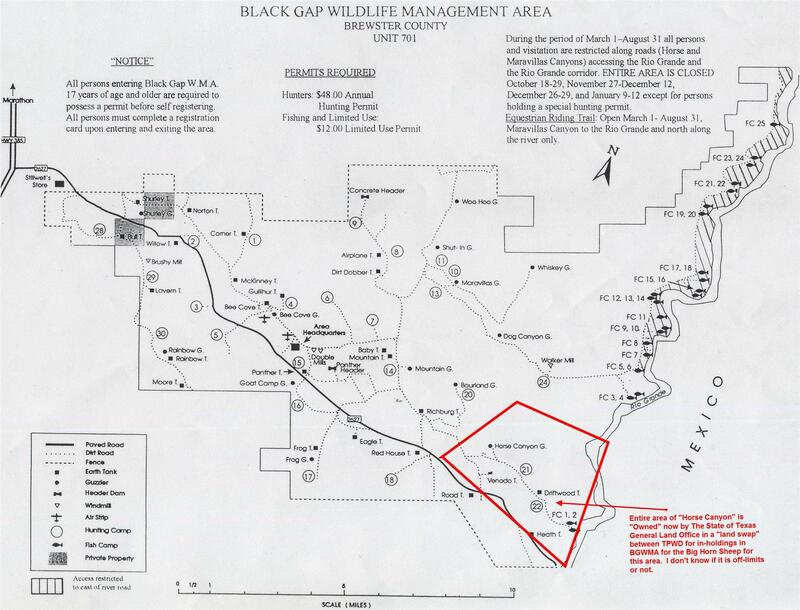 Found the attached map of BG WMA on the TPWD site. It seems to indicate that campsite locations are available (only?) at the "area headquarters/sign-in station." Wherever that is. I think it means that where the campsites are located can be found at the area headquarters/sign-in station. Not that the campsites are necessarily at the HQ/sign-in point. Hm, sounds like a mission to BG is in order here. Thank you fartymarty for this outstanding GE recon. Best information I have seen yet! I think those other structures you have identified but not marked are called "guzzlers" - collect rainwater for the animals. I agree with Casa Grande and Geezer that an expedition is in order! I was looking at Thanksgiving, but looks like the whole area is closed then - probably for an organized hunt. May have to go on the Spring Break 2014 list!